Palazzo Taglieschi, which houses the State Museum, belonged to the rich and noble Taglieschi family. It arose in the mid-15th century when some medieval tower houses were joined together. After sheltering Anghiari’s most destitute families in the post-war period, it was renovated in an attempt to recreate the atmosphere of a Renaissance house with its stone fireplaces and portals. It was later turned into a museum in accordance with the wishes of its owner, the priest-scholar Nilo Conti who, in 1959, had donated it to the State with this purpose in mind. 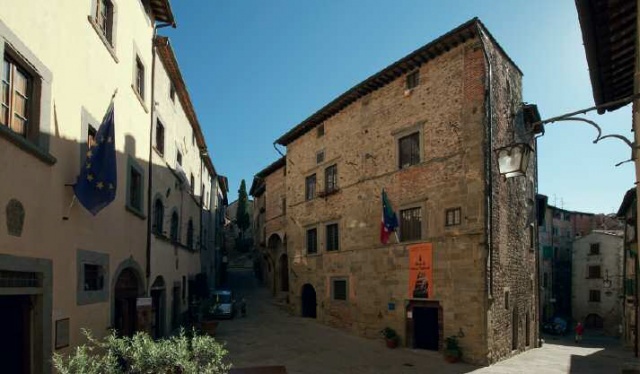 The museum is divided into about twenty rooms on four floors, connected by a wooden staircase in a lively and unusual succession of rooms that ends in a glass-enclosed loggia overlooking the town of Anghiari. The third floor houses a collection of Anghiari weapons, famous for their rich decorations, as well as paintings from the 16th and 17th centuries (Giovanni Antonio Sogliani, Matteo Rosselli, Jacopo Vignali, and Giovan Battista Ghidoni). The unique collection of Madonnine Agghindate, elaborately dressed statues of Mary, together with Father Nilo Conti’s rich collection of votive offerings and altar cards reconstruct some aspects of popular devotion. 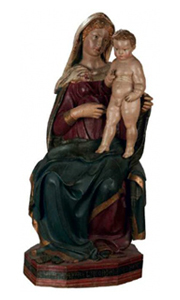 This beautiful polychrome wooden sculpture depicts the Virgin, Jacopo della Quercia’s masterpiece that, in the past, held in her arms an infant Jesus that may not have been pertinent. 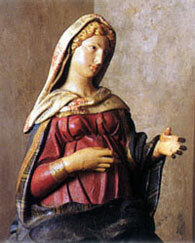 Dated to 1420 for stylistic reasons, the work was created for the Company of S. Maria della Misericordia expressly for a church in Anghiari, as indicated by the inscription in Gothic letters on the base of the statue: “QUESTA FIGURA FATTA FARE LA COMPAGNIA DE LA MISERICORDIA” (“the Company of the Misericordia had this figure made”). This image depicts Jacopo della Quercia’s sculpture with an infant Jesus that may not be pertinent. This Nativity with Saints was most likely made by Andrea della Robbia, together with Luca the Younger. 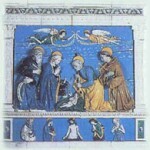 The work was commissioned in 1472 by Filippo Ducci di Catenaria, whose coat-of-arms appears at the two ends of the predella. It was later donated to the local Church of the Badia. Thus it is no accident that there is the figure of Saint Mark, the patron of the Compagnia di Misericordia located here, along with the one of Saint Francis, a beloved figure of popular devotion. Piazza Mameli, with the Battle [of Anghiari] Museum and the Palazzo Taglieschi Museum. 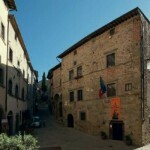 Anghiari (Arezzo). 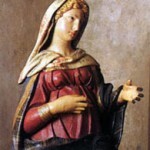 This statue is datable to the late 14th-early 15th century, from the Parish Church of Santi Lorentino e Pergentino in Ranco. The somewhat more archaic, less “classic” characterization of the face does not trace back the Madonna of Ranco to a more modest production. On the contrary, data emerging from the recent restoration have ascribed greater skill to its execution. An ancient building Palazzo del Marzocco in the heart of the old town. took place in 1440 and gave Tuscany its confines. These are preserved in the Palazzo. Prehistoric tools, Roman remains, Medieval fragments of sculpture, ancient manuscripts, glazed ceramics and fire-arms. This is a Palazzo Museum, but is also alive and dynamic, its doors open to everyone because it speaks of everyone, recounting history to keep alive the memories of everyone. The collection of archeological objects in the museum began with the donation of thousands of stone tools and chippings to the City of Anghiari by the “Center of archeological and natural studies of Anghiari” when it closed down. The most significant tools, and some that are important for their size and antiquity, are displayed alongside some reconstructions and a tactile section where you can handle some of the reconstructions of the tools: flints, scrapers, spearheads. 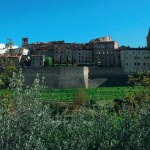 The first archeological scientific excavaton in the town of Anghiari took place in 2006. Since then, several digs and careful research in the area has been made, with the invaluable help of a number of volunteers, allowing us to display some of the most important of the objects found, mostly from the Roman period. New lines of research have recently been opened because of the wonderful discovery of a Roman wine cellar in Palazzo Pretorio and also some amazing Etruscan finds inside the Cassero. The room dedicated to this event shows us its fascinating and complex history from historical, artistic and iconographic points of view. The reconstruction of the Battle of Anghiari has been made with a model including hundreds of hand-painted figures; an installation about the technique that Leonardo da Vince used for his painting of the Battle of Anghiari; a large quantity of information about this historical and artistic event which makes the perfect frame to the 18th century reproduction of Leonardo’s lost painting by A. Fedi e M. Carboni. A gate-latch, an ancient book and a number of objects which universally summarize the history of this Tuscan town. Discovering the events that revolved around the “Bolt of Anghiari” (the gate-latch), starting from 1450, is a useful exercise for us contemporaries. So too is finding two amazing pieces of evidence of a pilgrimage route along the Tiber valley. There are some beautiful drawings of views of Anghiari made by Pietropaolo Taglieschi in the first half of the 1600s, “photographs” of an almost unchanged historical center. The collection of antique fire-arms was a significant part of the “Exhibition of the fire-arms of Anghiari and Tuscan-Emilian Appennines” held in 1968. It finally gave us the opportunity to see altogether in one room the special ability of the Vallini, Cerboncelli, Guardiani, Matassi workshops that combined the technical knowledge of manufacturing with great artistic skills in chiseling and engraving. We thank the Bank of Anghiari and Stia Credito Cooperativo for lending them to the museum. Anghiari’s pottery tradition has ancient origins and represented a very important and special artisan production: in this room it is possible to enjoy some examples of this work and see each step of the process from shaping to firing. The plate by Umberto Marinari, famous potter and decorator at the beginning of the 1900s is of particular interest. 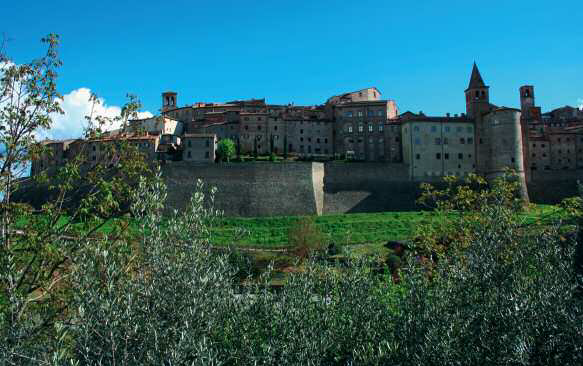 The present collection was donated to the town of Anghiari for the special exhibition “The pots of Anghiari” in 2005. Friday to Sunday: 10 a.m. to 7 p.m. Guided tours timetable: tue/wen/thu every hour from 9.15am to alle 5.15pm – fri/sat/sun every hour from 10.15am to 6.15om. From November 2nd to March 31st open every day: 9:30am – 1pm/2:30pm – 5:30pm. From April 1st to November 1st open every day: 9:30am – 1pm/2:30pm – 6:30pm. Reduced price ticket € 2.50 for Students under 25 years old; over 65s; teachers; Members of the Touring Club; journalists; groups of 15 or more people; companion to disabled visitors; owners of the “Valtiberina Museum Pass”. Free for children under 14 years old; ICOM Members; tour guides; Edumusei card; disabled. It can be possible for school trips, tours or events to visit the Museum outside the usual opening hours – advance booking is required. Trained guides are available to give tours of the museum. A minimum of 3 days advance booking is required for tours in Italian and 7 days for tours in English, German, Spanish or French. The price, excluding entrance tickets, for a guided tour in Italian: for a group of 10 or more people is € 3.00 per person; for a group of 9 or less people the price is € 30.00. Rates for other languages available on request. bookshop; guided tours; activities for families, groups, schools; internal library; meeting hall; wi-fi; customer satisfaction evaluation; garden. The museum is partially accessible for the disabled. The basement (front office, bookshop, Tiber Valley Room, info point) and the ground floor (prehistory room, Roman Room, Middle Ages Room) are accessible by ramps. The first and the second floor have limited accessibility using a stair lift with the assistance of the front office staff ( Battle Room, Codes Room, pottery and arms room, reference library/education). The museum is equipped with tactile installations for blind or partially-sighted people, including Braille (entrance, prehistory room). All the information inside the museum is bilingual (Italian and English). The museum offers multimedia equipment to assist with any physical and cultural difficulties.